Outdoor sculpture cannot be viewed as separate from its surrounding environment. In this respect, when chosen carefully and sited sympathetically, a garden sculpture can enhance a garden and give emphasis to design and plantings throughout the year. The creation is only half accomplished when the sculpture is finished – siting it might take less time, but can be the making or breaking of a sculpture . Ideally, gardens and sculptures should become equal partners in creating a new living whole. This approach to siting sculpture is diametrically opposed to the idea of a clean, whitewashed, neutral gallery, in which the sculpture is the sole protagonist . However, in a rich environment full of “distractions”, the sculpture feeds off, fits in and enhances the human-made natural world – this is the difference between a controlled and a living environment. In a garden, a sculpture relates to everything around it – the weather, the light, the vegetation, and the close and long distance views. It is an active relationship: a sculpture in the right position focuses, intensifies, and animates its environment. For this reason, siting a sculpture is both a rational, intuitive and creative skill. 1.Sculpture mimicking nature – plants, geological forms, pebbles etc…The sculpture uses patterns and formal elements of plant growth: the spiral (fern ); the flower (a round centre with repeat petals surrounding it) ; the tree; the vegetable or fruit. Mostly, these are more or less abstracted and simplified; sometimes enlarged. Animal sculpture might fit this category. 4. Abstract sculpture, sometimes with little concern for form, but instead a strong emphasis on the material, its qualities and texture in contrast to the foliage, or water surfaces – it could be glass, stone or wood. The “natural “ aspect of sculpture is the focus on its material, a token from nature. 5.The garden, or a part of it, becomes a sculpture/installation in its own right – some of the Japanese Zen gardens might fall into this category. Respect – status and formality ? Awe, a sense of mystery and surprise? Humour, a joke – surreal displacement? Calmness, alertness and presence of mind ? The height of a sculpture, in relation to the eye-level of the viewer, and of the height of other plants and sculptures is a crucial aspect of siting. Height directs the gaze to the part, or the angle at which the sculptor wants her work to be looked at. As a sculptor, one is very aware of the best view of one’s sculpture. For instance, with the “Mother and Child” above, I would like the viewer to look the woman “eye to eye”, to create empathy . Obviously this cannot be perfectly controlled, as the eye level varies depending on body height (between 1.40 and 1.80m), and changes with the laws of perspective as you approach the work. If sculptures are grouped into one neighbourhood, heights of sculptures could either repeat, or vary. What space – of distance or proximity – do they create between each other? What silhouettes do they delineate, and where do these lead the eye towards? How do the sculptures merge into one view and form one image? How does the sculpture relate to others nearby or further away – through colour, material, theme, through contrast or similarity? Depending on the height of the sculpture, the viewer has to put more effort into seeing it ; and depending on the character of the sculpture, it might want to be obvious, or more camouflaged and discreet. Looking straight at it, eye to eye, creates the closeness of an equal relationship. This is the most frequently chosen viewpoint. Looking down produces an element of discovery – the viewer needs to take initiative , and bend down to see the sculpture. It is modest, merges with its environment and becomes part of nature . This often is a suitable position for sculptures that mimic nature – plants or geology . A 3.b) plinth provides the practical means to regulate height of a sculpture, and can be fabricated from wood, metal, or stone. There are solid plinths , made from wood ( logs or r sure-cut) or stone, or more transparent, fine and less visually intrusive supports made from steel. Steel plinths , especially painted black, can appear unsubstantial and near-transparent, and don’t compete with the sculpture for attention . They are especially suitable if the sculpture should blend with the vegetation around it, be part hidden in it, in a flowerbed for instance. On the other hand, natural materials fit it well with the natural environment, and also add volume and weight to the sculpture. 1. Practical (safety): they hold upright a sculpture that might otherwise not be balanced. 2.Sometimes the purpose of a plinth is more than practical: similar to a frame around a painting it separates an object of the imagination from the remaining consensual “reality” – in this case the garden. Like the proverbial pedestal it elevates, even if not in actual height, and creates a symbolic boundary around it. 3.Status: the plinth gives the sculpture importance – it “prepares the ground” , similar to a red carpet for a VIP. Classically inspired and decorate plinths fall into this category. 4.Though not strictly considered itself art, the plinth affects the impression a sculpture make. The distinction between “art” (as “High Art”, an illusion and valuable) and “plinth” (being merely practical) can become blurred or even non-existent. Early 20th century sculptors Matisse and Brancusi became very aware of this issue, and experimented with plinths, that contributed to, merged with, and finally became the sculpture. Brancusi was a sculptor who both carved, and constructed – i.e. made sculptures by combining separate forms together. He used several colours, materials and simple forms for his plinths, and assembled or constructed them on top of each other. Sometimes the plinth’s purpose of support transformed to become the sculpture’s main idea – about the law of gravity, pressure and balance, about “below” and “above”. The plinths show the beauty and purity of simple forms and natural materials – differently coloured stones and woods, used in contrast to each other. What these artists made me aware of, is that the support of a sculpture cannot avoid becoming part of it, so long as it is visible . A plinth, though more neutral and practical in nature, needs to be carefully thought of and fit in with the work above, and the garden around it. One way to avoid becoming involved with the plinth altogether, is to camouflage it. In a garden, it lends itself for the sculpture to being hidden in shrubbery.This will help draw attention to only the sculpture, make it appear as if it has grown out of the foliage. For life size or monumental work resting on the ground platforms are the only option, either with or without a separating base. Similar to plinths, a platform has a practical and a visual/symbolic function. This stone carving might well need an even and hard base on which it can balance or be attached to. However, though the platform does not raise the sculpture by much, it makes a great visual impact. It has much surface area, a tone much lighter, and a colour much warmer than the surrounding lawn; this unifies the platform with the sculpture, and supports the sculpture in keeping it apart from the surrounding lawn . The placement of this head by Elisabeth Frink so close to the ground makes it visible at eye level only from afar. It gradually becomes lower as we approach, yet grows in scale. This earthbound position stands in stark contrast to its monumentality, and makes is less intimidating. The resulting image can create strange associations – as if the body – though separated by the base – might extend underground, invisible to our eyes! In the this case, the white contrast strongly with the dark green of the shaded lawn , and thereby has an impact and creates drama . The sculpture above is positioned in a theatrical space – an open lawn, yet surrounded by trees at a respectful distance framing the event. This sculpture raises questions about how the sculpture rests on the ground – about gravity and balance. The sculpture touches the ground only on three points – the spoon form seems to be leaning, tenuously balancing, while the form to the back and right slides into and off the lawn. With these many undercuts, the sculpture gives the impression of lifting off the ground, and keeps thereby its own separate integrity . A dynamic sensation follows, as if it was flying off in a circular motion into the air – or as if it just landed from somewhere in outside space…. These sculptures here relate in a rather different fashion to the supporting ground: they are earth-bound and settled, as they copy the forms of plants, transposed and alienated into a larger size. ”In the Beginning” is still more separate, while “Surkos” has sunk further, and embedded itself in the grass, its upward orientation suggesting roots below. Manipulating closeness and distance to the sculpture through garden design is an important tool in controlling the viewer’s experience of it. The impact of a sculpture is made up of all the different views onto it, varying in angles and distance. Perspective – the distortion (shrinking or enlarging ) of objects through space – can be actively employed to this end. Perspective is a magic transformer of objects and space – If we only could see it! Sadly, our eyes have grown accustomed to it through our continuous experience of it since infancy. In garden design, perspective can be exaggerated by creating a smooth transition from taller to shorter plants, to give a sense of depth and distance, making the garden seem larger than it really is; a sculpture as a focal point can either enhance or disturb this illusion. Paths, earthworks and plant growth can hide or reveal the sculpture in turns; walking and looking are two different ways to becoming part of this space, and explore these transformations of the sculpture. With a monumental sculpture for instance, what appears whole from the distance, can become huge, engulfing, and only partly seen and understood from close up. Or a sculpture well within one’s field of view lies beneath one’s feet as one approaches it. The lay-out of the garden determines if a sculpture will be seen from a distance and shrunk through perspective; on top of an inaccessible hill, as a silhouette ; or only close up – hidden until one discovers it. There can be positions within the garden with higher and lower views of the same sculpture from different sides. In Great Britain, with its climate that does not entice outdoor life for half of the year, sculptures can be positioned in such a way, that they enter the domestic sphere through indoor window views. Garden design can encompass two contrasting modes, each expressing a different emotional stance: open vistas, often large lawns, versus closed rooms, created by overarching branches of single mature trees, tall hedges, woodland or walls and courtyards. Small sculptures often seek refuge in a secluded space, for instance in the dappled light of tree foliage forming a loosely perforated cave. Even larger sculpture sometimes only thrives in such an intimate space, because of the theme or feeling it expresses – in the case of “Mother and Child 2” protectiveness and a close bond. The sculpture wants to be discovered and surprise you on your wanderings through the garden, with no early premonitions of long-distance views. On the other hand, a sculpture can be positioned in the open and provide a focus in an empty area of the garden. Raised above pristine lawn, it is exposed, impressive and domineers its surrounding space. Being visible from afar, it grows slowly in size and detail as you approach it at walking speed, the point of view changing continually. Emotionally, this is another journey compared to the surprise-and-secret-sculpture – there is expectation, a self-conscious awareness of an impending meeting with a non-living, though equally charged entity. This position certainly helps to view the sculpture from all angles, which is difficult when it is placed within flower beds. It is often the preferred option for large sculpture exhibitions – the balance in the mutual relationship between garden and sculpture is tipped towards the monopoly of the sculpted form: the lawn just offers a clean backdrop to show it off . The garden acts as a vacuum to be filled by the sculpture. Choosing the right position is really a matter of scale :the smallest sculpture suitable for the outdoors might be 50 cm high, on a plinth in a narrow courtyard or the above mentioned “green caves”. In some of the sculpture shown on this page, scale – enlargement, or the deviation from “natural” size – is a crucial ingredient of their intendend effect. To me, it poses a paradox, all relating to scale: naturally, the human figure should be “life-size” – our size, a way to measure the world by seeing it from our perspective (see lower down Frink’s figure near rhodondendron) . The position of this sculpture reminds me slightly of Da Vinci’s drawing of the Renaissance ideal of man as the measure of all things – outstretched figure filling out circle and square. This colossos is closer to heaven than to the earth – but like us is part of neither. This issue of space relates to how a sculpture can be viewed: either frontally or in the round – in the pictorial or sculptural mode. Many sculptors prefer their work to be seen from all angles – especially if the sculpture has important features on the side or back, or can only be understood by walking around it, and taking in the smooth transition from one view to another. However, this wish has to be balanced with other considerations, or simply with the necessities of a place. The frontal view, while sacrificing a more comprehensive view of the sculpture, can contribute aesthetically. Below left, the smooth and reflecting bronze bodies of the “Etruscan Couple 1 “ contrast with the background of light and dark textured beech foliage, making it stand out. “Mother and Child 2” uses the radiating foliage on the back as a baroque-style halo, associating this image with the Catholic Mary and Jesus ; the raised position and ornate plinth supports this altar like impression. Quite frequently, the frontal view goes hand in hand with greater formality and structure, fitting in with the surrounding architecture – as for instance at the end of a straight path, against a hedge or a wall. Formal gardens often surround historic buildings, and involve box hedges, straight flower borders, steps, terraces, walls and shingled, often straight paths. By placing “Big Embrace” in this context, I am juxtaposing a very relaxed spontaneous gesture with a straightened formal surrounding – contrasting with it, and possibly softening it. These “Mythical Horses” beside add both humour and a sense of the ridiculous. Both their relative scale, and their positioning close to the highly structured environment of a box hedged herb garden make them look out of the ordinary. These creatures emerge out of the ground – or are they seals diving out of a green sea ?- to confront us with an unlikely version of reality, that undermines all our small and square desires for predictable order. In its symbiotic relationship with the garden, a sculpture can be either subservient, guide the eye to some other aspect of the garden, or become the goal towards which the garden directs the viewer. The latter is the case with the sculpture on the right. It is a good example of a path enhancing the position and the attention a sculpture receives: by acting as a barricade to the pedestrian, the sculpture becomes the focus and endpoint of our attention. Garden designers often use a sculpture as a focal point. A focus slows down the journey through the garden by stopping and directing the gaze, as well as the feet traversing through its expanse. The garden is slowly discovered rather than swept through superficially; this enlarges the garden, at least in the subjective experience, as visitors take more time to perceive their environment – and become engrossed by using their senses of sight, touch and smell . Rather than merely passing through the garden, the sculpture surprises, intrigues, draws attention from the viewer – and this awareness then not only rests with the sculpture, but spreads into its immediate surrounding . Much figural sculpture in this context personifies and objectifies our personal experience – the perceiver that we are : the body we inhabit, that stands in nature, participating, yet apart. The sculpture intices identification and self-awareness. On the other hand, figurative sculpture transforms nature into a garden inhabited by the human spirit, its dimensions measured on our terms. The sculpture above for instance, through its sheer scale, draws attention to the face – the seat of thoughts, awareness, and tools of perception like eyes, nose and mouth. The steel structure behind the mask holding up the illusion of the monumental steel face is made obvious, and dissolves into the environment similar to scaffolding holding up a flimsy film set. Another frequent preoccupation of sculptors is to populate parks and gardens with human figures, that stand in our-stead and humanise the garden. They either are un-self-consciously involved in an activity, or the opposite – they reflect, partake in their environment through observation and simple being. Gardens and sculptures relate to each other in such rich and unpredictable ways, that a new view point, a certain kind of light, or an animal entering the stage in an unforeseen manner can trigger a new angle on it, and a new meaning. The placing of Frink’s sculpture above demonstrates how the life size human figure stands there in our stead – through its shape and height it creates a space out of the surrounding grouping of lebanon pine and magnolia, its size measured by our human proportions. There is a completeness in this siting, as the sculpture fills a loosely shaped hole created by borders and tree. Air – unsubstantial nothingness, the open space above and around us : it is an unobtrusive theme of both sculpture, and gardens. We feel it on our skins through the breeze, the rain, the sunshine; we absorb it into our bodies through our in-breath.It envelops us wholly, pervades us to the degree of not knowing of its existence – yet it is only the space around objects that gives it their solidity. Gardens, with their focus on the earth, and the plants it grows, are nonetheless domineered by one overriding aspect that can neither be controlled nor designed – boundless sky, in continuous transformation through time of day, season and weather . Starting in the 1930ies, Barbara Hepworth and Henry Moore dedicated many years of their oeuvre to “sculpted holes”. In art jargon, space trapped and surrounded by sculpture is called “negative space” – solidity focusing on transparency. Like often in art, opposites attract, and energise each other: negative shapes make volume appear appeal more solid. In the sculpture above the archetypal theme of a doorway and boundary is powerfully made evident. The hole appears to me to roughly fit the shape of a cloaked human being – as if s/he broke through a wall and dissolved into air, leaving her passage through matter behind as an imprint and reminder. If the negative space is large, it acts like a frame to the surrounding landscape – it emphasises our constricted and personal perspective versus the unlimited surrounding. It highlights what is not. In an abstract manner, it still represents our focussed human perspective onto the world – like a large eye.It is small and localised in comparison to its environment; and it is both porous yet separate from it. “Abstract Wave” is one of several open circles forms I experimented with. As one circumnavigates the sculpture, the view onto the garden through this hole changes continually . Although smaller than the above examples, this sculpture too acts as a frame to the garden – focusing through it like with the view finder of a camera. And like any frame, it emphasises the image that is found inside. Sculpture and gardens use mostly the same visual language: Proportions, scale, perspective, rhythm (variety versus simplicity), form versus surface, and the use of line, tone, colour and texture all contribute to a cohesive whole we recognise as art. In the next chapters I will analyse their various ways of implementing these aesthetic principles. Texture – the surface material quality – is a crucial aesthetic dimension of both garden design and sculpture. It is explored through touch, but also visually: through manifold experience, the eyes can imagine what something feels like to the hands, which further informs the general impression one beholds. The sense of sight however, gathers information from afar; while the sense of touch deals with our most immediate relationship with the environment. In our technological and industrial age, the vocabulary of our hands is much reduced – to the movements needed for keyboards, car driving and assembly production. It is a much neglected and underused sense, that needs reawakening and stimulating through gardens and sculpture . Texture in relation to sculpture varies depending on material, and the use of tools: amongst others, outdoors sculpture uses stone, wood, fired clay, bronze cast from plaster and clay… and more recent materials like steel, plastics and glass. In the image above, the stone (possibly marble) might have been puckered with the marks of a “punch” (a stone tool ending in a point), while the remaining surface had been sanded for smoothness – the result is a contrast of rough and smooth attractive to the hands, and mesmerising to the eyes. Texture in gardens I have already referred to (link) before – it relates to differently sized and coloured foliage making a closely or loosely woven pattern through repetition of the same elements, for instance individual leaves. The sculpture above is divided into shaded and sunlit areas, in places quite randomly against the grain of the form. 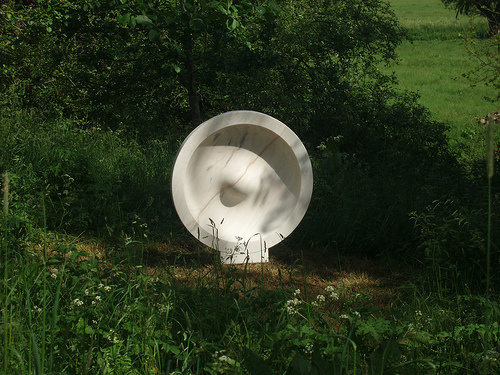 The rolling surfaces become a distorting mirror for the apple tree branches to the right – for instance the shadow of one branch being pulled up the shoulder, neck and cheek of the figure, emphasising the shallow curves of the surfaces. Other shadows just simply swallow the form, and render it invisible and flat.The overall impression is of a figure part clearly and three dimensionally perceived, part merged with its dark background – both known and unknown . For the viewer, perceiving it becomes a challenge similar to filling out a dot-to-dot image. It also gathers an emotional undercurrant, that might well not have been intended.The shadow imprint of the vegetation is yet one more way for the sculpture to adopt to and merge with its environment, a poetical way to participate in, and camouflage into it. On the other hand, a sculpture in the open in the full midday sunlight is equally hard to read: raised surfaces throw a shadows onto areas nearby – while other shadows are more predictable, as for instance lingering in concave surfaces. The whole sculpture forms a patchwork of highlights and dark. This introduces a nearly graphic element thrown over the surface of the sculpture – clear black curves randomly supporting or contradicting in turns the original form. 2.The angle of the sun creates varying lengths of shadows, measuring the flow of time: as the sun does its daily round across the sky, it immerses various parts of the sculpture into light and shade, thus making it into a personalised sundial. The length of shadows on sunny days grows longer in winter. 3.The different quality of light depending on the weather – full of contrast, or diffuse. 6. Shade from plants nearby (distance or closeness of the leaves towards the sculpture): create out-of-focus or precise shadows – the closer the source of the shade, the clearer and smaller its imprint. Shadows are often found in cave like spaces created by overhanging trees, with the sculpture enfolded and enclosed by vegetation above and around it.With “Mother and Child 2” , the bronze reflection of the sculpture contrasts with its dark background. The dabbled light-and-shadow effect on its surfaces indicates foliage throwing shadows from higher up, with the odd branch closer by. It creates a tension between the solid volume of the form, and its confused surface that undermines it. Colour in sculpture and plants is yet another means of manipulating the space, and directing the visitors attention: depth can be created, or flatness simulated. Warm colours like reds, yellows and oranges seem to advance and can make an object seem closer to you. Cool colours like greens and blues seem to move away . Complementary colours attract one another (red to green, blue to orange, yellow to purple), and attention from the viewer. Bright colours stand out against more grey or toned down colours. In the above image, the sculpture recedes further into the bushes, that advance thanks to their reddish colouring – this contrast helps to emphasise the integrity and separateness of the form. The expectation for the sculpture to take up the foreground, and the garden serving as a background is negated by the colours; this creates a tension, which makes this arrangement more visually striking. This enlarged stone pea-pod pulls the eye into the distance by means of its cool colour and elongated form, while the pink rushed to the front ; the contrast of texture – varied green-pink of flowers versus the smooth polished blue-grey of the stone – strengthens this effect. There is another issue with colour on surfaces of sculptures – do we consider them “natural”, or synthetic? This question is particularly relevant within the garden setting. It relates in part to the material – wood, stone, or traditionally patinated bronze is accepted as “natural”, meaning grown, weathered, and irregular. Much of craft, and many sculptures are based on that idea of “truth to material”: recreating nature by using, emphasising and celebrating natural materials, with often muted colours – whites, beiges, blue-greys, browns.. However, a bright colour with no variations or graduation on plastic, and even a bronze surface appears “man-made”, challenging, and alien to the garden environment. Tony Cragg puts this contrast intentionally to the test. Due to its intense colour, the sculpture appears light and playful despite its size; the bronze is simulating plastic, which we associate with weightlessness. 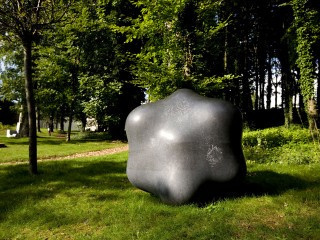 The sculpture “lifts off” from the darker coloured grass, and the contrasts between actual weight and apparent lightness lends it an unworldly, surreal feeling. Copyright: Cass Sculpture Foundation website. This last paragraph describes succinctly the relationship that exists in sculptures between the colouring of its surface with its volume. The surfaces of a sculpture – through colour, texture, light and shade – can either disguise or reveal, even exaggerate the solidity underneath them. Volume is what distinguishes sculpture most from other art forms – it is fullness and convex surfaces, as wonderfully demonstrated with this form on the left. Volume is the antithesis to air and transparency – it is heavy mass, localised and focused in one place. Like air, it too is invisible, but in a different manner: dark, “inside”, and hidden from view by the surfaces – we know about it through deduction, not from direct experience. Henry Moore was a sculptor preoccupied with volume and solidity, and how to best embody it in sculptures. Similar to visualising what is quintessentially human – the soul – as being inside our enveloping skin, Henry Moore believed that the vitality and “inner life” of a sculpture lies in its chore. A sculpture, in his view, could be more or less successful at embodying this inner strength. “Volume is probably the most enduring element in garden design. It is what is seen when first looking at a garden from a distance. Every plant has a distinct growth-habit, a unique mass and volume which develops and changes as the plant matures. Whether pyramidal, weeping, columnar, spreading, or round, they divide and define the spaces in the garden. The siting of a specific plant may block a view, or open a sight-line, or alter the view depending on the maturity and growth-habit of the plant – open or compact, herbaceous, evergreen or deciduous. These plant qualities often change with the seasons and restructure the lines of the garden. The form of the plants selected and their placement are critical to creating comfortable, dynamic spaces and pleasing silhouettes. In landscape design, “line is one of the more structural principles. It can mostly be related to the way beds, walkways, entryways [and silhouettes of trees or bushes] move and flow. Straight lines are forceful and direct while curvy lines have a more natural, gentle, flowing effect”. Gardens and sculptures working in tandem are such a powerful combination, as they both demand of our senses to respond to them: they pull our awareness back into our body, so that we may return our attention to where we are . Sculptures speak to our hands, eyes, sense of balance, and of being in the body. Gardens present an even more multi sensory experience: further to the just mentioned senses there is also sound (rain, bird song, wind in the leaves) smells, the perception of the weather on the skin – wet or dry, windy or still -, the touch of leaves brushing against the body and the experience of gravity and the consistency of ground under one’s feet. All of these add up to to an heightened awareness, a presence of mind and body rarely experienced. It is no wonder that the Christian story of origins starts with the Garden of Eden – nature tamed, ordered, formed and made habitable for humans. In this beneficial environment, it might become easier for us to return to an experience untainted by the habitual adult attitude of only knowing our environment mentally – ticking it off, so to say – , rather than experiencing it physically and spiritually . This multi-sensual appeal of gardens dissipates our attention, as we spread it across these varied and complex stimuli. “One switches gears”, from a goal oriented, driven and preoccupied state of mind bent on efficiency, towards reflection and a greater relaxation We become more open – it is as if our boundaries grow more porous. The lack of focus helps us to merge with our environment, and the flow and overlap between inner experience and outer world is restored. This is a perfect setting to engage with sculpture – to look longer and feel deeper – as one is more prepared to see and find beauty – a connection, meaning and order . I would contend that many sculptures of sufficient size are better presented in this context, rather than a gallery. A garden as an art form is never finished; It is ever changing with the movement of the sun, wind, the seasons and the number of years; plants growing in size, filling a place, thinning, finally decaying and leaving a gap. Gardens embody that most important aspect of nature – transformation and transience – and help us to to aclimatise to and feel at ease with it . Sculptures, however, are more permanent – they remain, often longer than a human life time, and only suffer the much slower transformation through erosion. Thus the sculpture is a permanent reference point to record nature’s ongoing processes: dew in summer, frost in winter, rain, snow, hail; spiderwebs, leaves, insects, birds all come and go. The sculpture’s surfaces reflect all these changes – while its form, or volume remains unscathed and immutable. This crucial difference between sculpture and garden creates a fertile tension between time and permanence. A sculpture in winter, exposed in a bare and denuded garden in bleak light, needs to bring its own energy to this weakened environment . Snow will add a three-dimensional layer to the sculpture, covering it unpredictably, depending on the angle of the surface in its relationship to gravity and wind direction – figures will look partially dressed, and buried in the ground. Sculpted fountains, water walls and features enact this drama of time and permanence equally well: the water rushing on, always renewing itself – the sculpture remaining the same, solely acquiring erosive marks over the years. Similar to Gormley pronouncing air being a “sculpting medium” crucial to creating the spacial impression a sculpture makes, water is the perfect medium to describe time in relation to sculpture. Archie Held chose an abstract vertical split form to express calm permanence juxtaposed with the never-ending rush of time and water; the rough and smooth stainless steel reflecting light, another effective means of measuring time . This dichotomy of flowing time and eternity reverberates with a deeply human experience: To feel yourself to be the same, yet not a single original cell remained in your body ; More aware of changes in the environment, rather than inside yourself; the heroic and ego-led clinging to the idea of a permanent self constantly negated by experience of nature. Maybe this accounts for why sculptures in gardens mirror so well our internal experience.